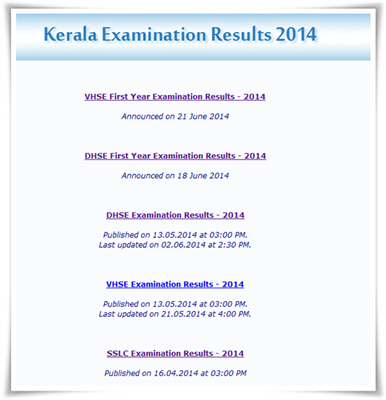 The Directorate of Higher Secondary Education (DHSE) will soon publish the result of Kerala DHSE Plus Two SAY/Improvement exam held in first week of June 2014. The Centralised valuation of SAY/Improvement examination of IInd year Say/Improvement started on 12th June while for the subjects Biology, Sociology, Computer Science, History, Home Science, Business Studies, Islamic History, Electronics, Electronic Service Technology and Communicative English the process started on 16th June 2014. Even though the exact date of publishing the result is declared, it is expected to get published by the end of June or the first week of July. In the previous year, the result of the SAY exam was announced on 28th June 2014. As soon after the notification regarding the announcement of result, it will be made available in the websites, www.dhsekerala.gov.in, www.keralaresults.nic.in. After the official declaration of results, the students who have complaints or doubts can apply for Revaluation & Scrutiny for all subjects except Physics, Chemistry and Mathematics. Students can apply for Photocopy of their answer scripts of all subjects. The fee for Revaluation per paper is Rs. 500, Scrutiny Rs.100 and for Photocopy Rs.300. The application must be submitted to the Principals of the schools where the candidates have registered for the exam. As the prescribed application forms will not be received directly in the Directorate, students can get it from the schools or from the department portal. After the revaluation process gets completed, if changes occur in marks, it will be intimated to the students directly or through the web portal. Fresh certificates will be issued on production of the original certificates within the specific time. As per the procedure, the data in the applications for Revaluation, Scrutiny or Photocopy of each school will be uploaded using software. The revaluation and scrutiny result would be published in August 2014. Students are advised to keep an eye on the DHSE web portal and also the leading dailies regarding the declaration of the SAY/Improvement results.